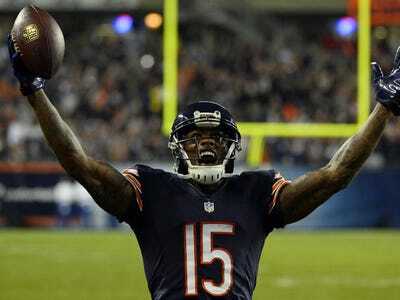 Brandon Marshall got into a Twitter war on Thursday with a Detroit Lions fan, which ended in him offering the fan $US25,000 to fight him, according to ESPN Chicago. It started when a Lions fan reminded the Bears star receiver about his comment about a year ago referring to the Lions as the “little brother” of the Chicago Bears. “Marshall responded by challenging the fan to step into the ring with him for $US5,000, later posting on Twitter that if he lost, he’d give up another $US10,000. But if Marshall won, the fan would have to serve 100 hours at an orphanage, the receiver said. “@AnthonyGKalla: @BMarshall that’s it? Cmon brandy make it 25 and we can do it in Detroit”And you have to apologise to my mum.